Sol-gel chemistry allows the immobilization of organic molecules of biological origin on suibtable solid supports, permitting their integration into biosensing devices widening the possibility of local applications. The present work is an application of this principle, where the link between electrical receptor platform and the antibody acting as biorecognition element is made by sol-gel chemistry. The immunosensor design was targeted for carcinoembryonic antigen (CEA), an important biomarker for screening the colorectal cancer, by electrochemical techniques, namely electrochemical impedance spectroscopy (EIS) and square wave voltammetry (SVW). The device displayed linear behavior to CEA in EIS and in SWV assays ranging from 0.50 to 1.5ng/mL, and 0.25 to 1.5ng/mL, respectively. The corresponding detection limits were 0.42 and 0.043 ng/mL. Raman spectroscopy was used to characterize the surface modifications on the conductive platform (FTO glass). 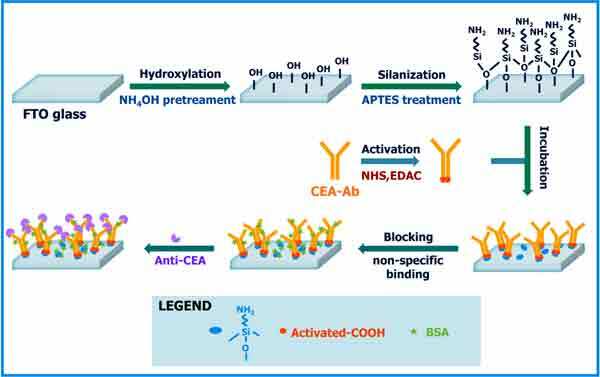 Overall, simple sol-gel chemistry was effective at the biosensing design and the presented approach can be a potential method for screening CEA in point-of-care, due to the simplicity of fabrication, short response time and low cost. Antibody, Biosensors, Cancer Biomarker, CEA, Sol-gel.